ECONOMICALLY efficient, Heat and Control 's Mastermatic Canister Filter for continuous fines removal for batch and continuous fryers is an innovative and inventive machine that will improve any production process, says Heat and Control. The Mastermatic Canister Filter continuously removes crumbs and carbonized particles during fryer operation and results in an improved product as oil quality and product shelf life are prolonged. In normal use, there is no need to discard frying oil as standard process is to simply replenish the oil absorbed by products. Therefore, the amount of oil required is reduced and as a result so are production expenses. Cleaning costs are cut as the Mastermatic Canister Filter prevents fines from accumulating in the fryer. Particles are easily cleaned from reusable, lift-out filter bags. Pressure gauges indicate when bags should be replaced, ensuring that waste is eliminated. In terms of safety, safety interlocks prevent the opening of the filter when the machine is working. Simple and straightforward to install, the Mastermatic Canister Filter consists of a modular construction that includes piping and valves connecting a centrifugal pump to the stainless steel filter canisters and all of this comes preassembled on a stainless steel base. Stainless steel piping and valves are an option. 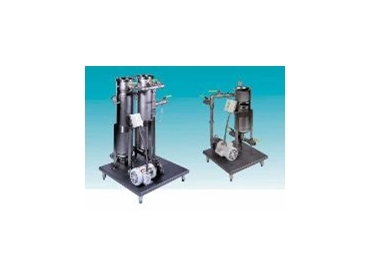 Models with one, two or three canisters are available for fryers with oil capacities ranging from 15 to 490 gallons. Filter filament sizes are available to suit any application.